Sikh civil society groups have condemned Pakistan’s decision to ban activities of Sikhs peacefully campaigning for ‘Referendum 2020’ in which Sikhs plan to defy New Delhi and exercise their democratic right to vote on the issue of self-determination. Next year, Sikhs intend to vote either “yes or no” on the question of whether Khalistan should be formed as an independent state that would separate from the Indian state of Punjab. Similar votes have happened throughout the world with a wide array of results. In 2014, Scotland narrowly voted to remain part of the United Kingdom (UK) in such a vote, whilst in 2017, in a vote that was not recognised by Spain, Catalonia voted to become an independent republic. In Indonesia’s Western New Guinea (often referred to as West Papua internationally), there have long been calls for a new referendum after the initial vote in 1969, in which the region voted to integrate with Indonesia, has been described as un-free and unfair for ordinary people in the region. Even more recently, the French overseas territory of New Caledonia voted to remain politically united with France. Perhaps the most politicised referendum in recent years was when Crimea voted to leave Ukraine and rejoin Russia. The result of this vote has been recognised by Russia, North Korea and Syria but few other nations. Of course, the world’s most controversial self-determination referendum is one that the United Nations (UN) first called for in 1948. This is the yet unrealised vote for self-determination in Kashmir. While Pakistan has generally warm relations with the global and domestic Sikh community, it appears that Pakistan effectively succumbed to bullying from its militant Bharatiya Janata Party (BJP) ruled neighbour. Of course, it is Pakistan’s domestic right to ban whatever political or activist groups it desires, including peaceful ones like the Khalistan movement. In this sense, the biggest problem is that Pakistan moved against a very small group of Sikhs who planned on hoisting banners and handing out literature at a time when India’s Research and Analysis Wing (RAW) continues to work with the Kabul regime to promote terrorism in Pakistan’s Balochistan province. Likewise, Indian forces continue to inflict supreme violence against the civilians of Kashmir. In this sense, Pakistan has leverage that it refused to exercise against India. If New Delhi is so desperate for Islamabad to prohibit insignificantly small groups of Sikhs from handing out non-violent political literature outside their places of worship, Islamabad could have said ‘we will only prohibit Khalistan activism if India gives Pakistan all of the details of the last 50 years worth of Indian meddling in Balochistan, ceases its promotion of terrorism in Balochistan via Kabul, begins a ceasefire in occupied-Kashmir and renounces all forms of military violence as a means of conflict resolution with Pakistan’. In other words, it takes two to tango. If India wants Pakistan to ban peaceful symbols of a Khalistan referendum on its soil, India had better cease fomenting violent separatism in south-western Pakistan. But in typically anti-strategic fashion, Pakistan simply capitulated to India’s bullying and got less than nothing for it. 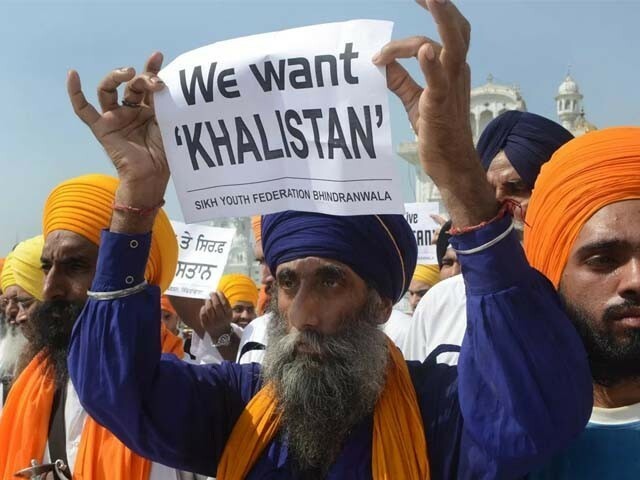 The concept of getting less than nothing for it can be proved by the fact that major pro-government Indian media outlets continue to claim (without evidence) that Pakistan is officially promoting the Khalistan movement in Indian Punjab when in fact the Khalistan movement’s presence outside of India is almost all in either Canada or the UK, with other activists present in the United States and parts of continental Europe.